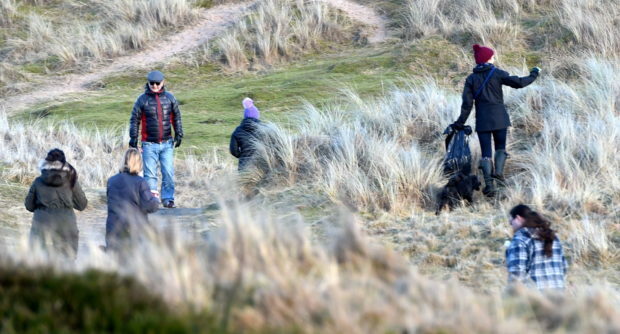 A clean-up at the Balmedie Country Park beach area earlier this year. Picture by Jim Irvine. A scheme to make it easier for people with disabilities to explore the golden sands and shoreline at Balmedie Beach has been set up by a charity. Volunteers at the Sand Bothy visitor centre have begun raising money for an all-terrain wheelchair and hoist which can be lent out to families taking a trip to the seaside. The £3,200 Hippocampe chair has balloon wheels for traversing sand and a corrosion-resistant frame to withstand sea salt. The idea for the rental service was brought to the group by Aberdeen mum Laura Henry, whose 13-year-old son Ben has quadriplegic cerebral palsy, after she saw a similar initiative in Berwick-upon-Tweed. “When you go onto the really soft sand, you just can’t get the wheelchair through it,” she said. “And some need to take oxygen tanks and other equipment, and the weight of the chair is so heavy there’s absolutely no way you can push it over sand. “It’s really sad as a ‘regular’ family wouldn’t think twice about this. “But other families who have able-bodied children with them can’t all go to the beach either – you have to have two sections where one stays away from the water as they can’t go on the sand. She added: “It would be a massive tourism benefit as a lot of people come to Aberdeen for its beaches and they can go to the promenade but can’t go near the sea or touch the sand. Belhelvie Community Trust, which operates the Sand Bothy, has been working with a number of groups including Aberdeenshire Council to improve accessibility at the beach. Secretary Rosie Nicol said: “There are a lot of problems here because the beach has moving sand dunes, and is not a static beach like others.